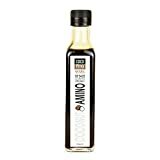 Cocofina Organic Coconut Amino is a healthy and naturally gluten free substitute to soy sauce. Coconut aminos is the ideal option for gluten intolerant, those watching their salt intake or allergic to soya. Coconut aminos is a sauce made by fermenting and aging coconut vinegar, coconut nectar, onions, garlic and salt. Allergens: None Suitable for Vegetarians & Vegans. Keep me in a cool place, refrigeration is not necessary until opened. This Organic Coconut Amino is perfect to use instead of soy sauce in stir-frys, salad dressing or marinades. This entry was posted in Organic Health Products and tagged 250ml, Alternative, Amino, Cocofina, Coconut, Organic, Sauce by Organic Health. Bookmark the permalink.